When Pierre-Emerick Aubameyang handed the ball to Alexandre Lacazette when on a hat trick against Stoke City, the Gambion got some grief from some attention seekers. Here was a striker, who should be hungry for goals, already with 2 (including 1 penalty) handing the ball over to a team mate. One fan, who must have had some good betting information, had stuck a fiver on him getting a hat trick was especially angry. But what it showed was Aubameyang’s awareness of a fellow striker who was going through a bad patch. Before he joined the club, Aubameyang had been highly criticised in the press. Egotistical. Self-interested. Flashy. A big time Charlie. A poor team mate. The majority of these comments were by people who did not know him. Had not followed his career. Had probably never had dealings with him. They saw the flash cars, the jewellery, and his skin colour and judged him. Like they do with Raheem Sterling. That day against Stoke City, Aubameyang showed exactly who he is. He saw Lacazette through his own eyes as a striker. His team mate had scored 1 goal in 13 games. Had an injury. Had not really settled at his new club. Every striker will recognise another striker struggling. The simple chances get skied or put wide. The confidence is not their for one on ones. The offside flag gets raised more often than not. Aubameyang’s two goals against Stoke City had made it 5 goals in his first 7 games for Arsenal. He could have easily made it 6 in 7 and walked off with the match ball. Other strikers (Harry Kane) would have done. They would have been greedy. Even if it was at the detriment of their team mates. By giving the ball to Lacazette, he hoped that a goal would spark him in to life. Would shake the cobwebs. With himself being cup-tied in the Europa League, he knew that it was more important for the team for Lacazette to score than himself. Lacazette slotted in the penalty. And Aubameyang got it right. It did spark Lacazette into life. The Frenchman is now 5 in 6. Against West Ham, Lacazette scored twice. One of which was set up by Aubameyang. What stuck in my mind re-watching the game last night was the celebration of the Arsenal players. A huge fuss was made when the side looked split after Alexis Sanchez scored against Crystal Palace. It was back page news. Against West Ham, the team celebrated as one. And it was the final embrace that inspired this. The last two to celebrate together were Lacazette and Aubameyang. A warm embrace. One which showed genuine friendship. Lacazette was delighted to have been scored, and Aubameyang looked equally as delighted for him. It highlighted the togetherness of Arsenal’s record signings. For Arsenal, top strikers have been like busses. We have waited a decade for a pacey, direct striker, then end up with two at once. And there has been plenty of talk about how they would fit together. Can they play together? Will they be happy rotating? Might one end up leaving? They might not be suitable to play together every game. With Henrik Mkhitaryan and Mesut Ozil to be added to the team, it will give the new manager plenty of food for thought on how to line up. What is for certain is with all 4, we have options. Different formations. Different tactics. It should be remembered that for Dortmund. Aubameyang played a season alongside Robert Lewandowski. He was out wide with the Pole up top. It is a roll the he can perform. The budding relationship between Aubameyang and Lacazette is one of the few positives from this season. And one that we can begin to get excited about next years. 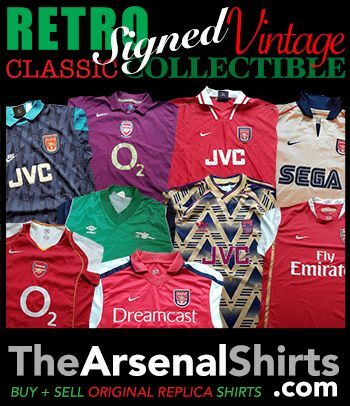 Cut off for Bergkamp signed Clocks + Shirts is Friday. Bruised banana logo polo shirts are up. 1886 T shirts are up. This entry was posted in Arsenal and tagged Alexandre Lacazette, Arsenal, Pierre-Emerick Aubameyang, She Wore, She Wore A Yellow Ribbon on April 25, 2018 by keenosafc. Yes only for some other manager to enjoy now.